Il Tetto rooftop beer garden at Sienna Mercato, Downtown. Photo courtesy of Sienna Mercato. Ten years ago, if you wanted to eat outside in Pittsburgh, you practically had to pack a picnic basket. 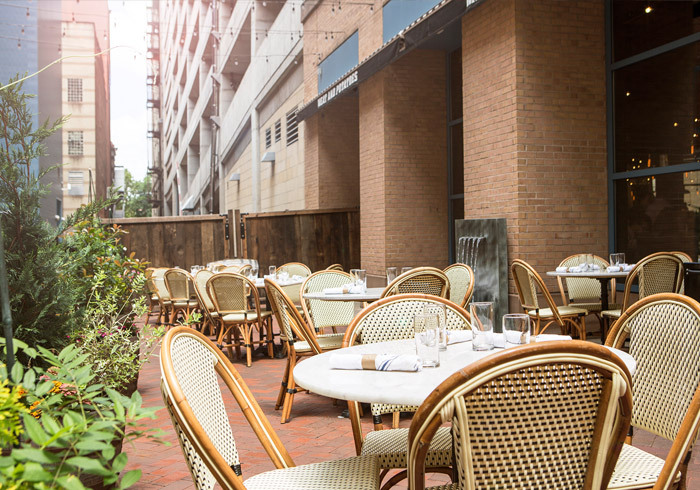 Now it seems like every new place in town—and half of the old ones—offer some sort of outdoor dining and drinking. Maybe it was the “Paris to Pittsburgh” program for Downtown restaurants—Colcom Foundation-backed grants of up to $30,000 to fix up facades, add tables, awnings and lighting. The recent rebirth of Market Square, after its 2010 makeover, probably helped. Ultimately, though, people love to be outside. 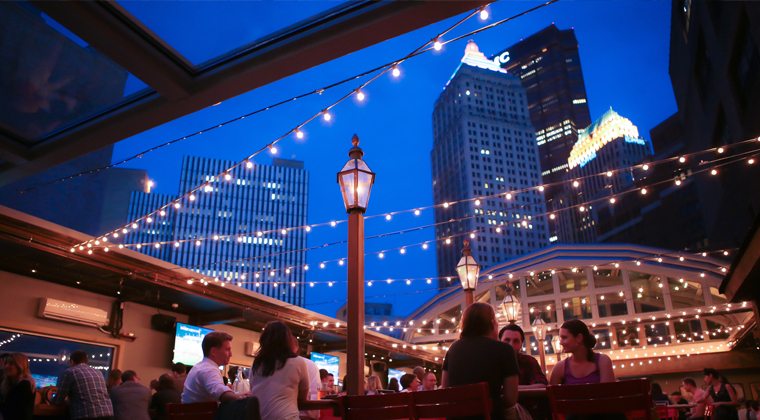 Whatever the reason, if you’re looking to soak up the sun (or the stars) while dining in Pittsburgh, you need to know where to go. 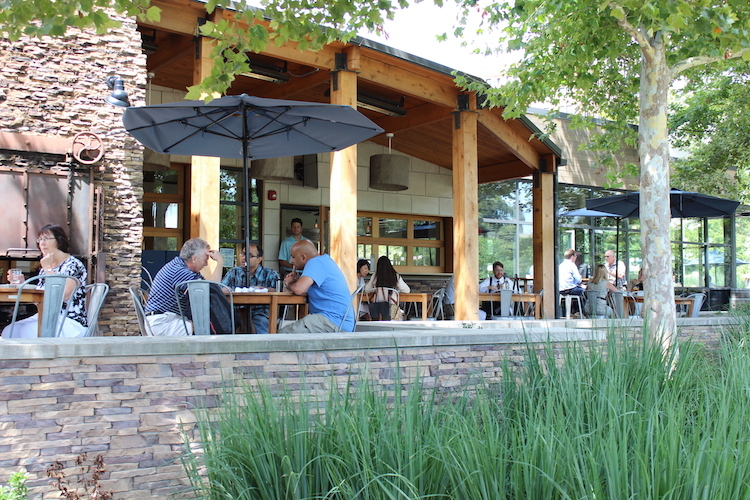 Here’s a list of some of the best outdoor dining options in town—the ones you should run to when the summer breeze beckons. We welcome your suggestions in the comments below. Il Tetto at Sienna Mercato, Downtown. Okay, so all the big cities were doing this already, but here it’s still a novelty and this multi-level meatball emporium does it really well. The walls of the adjacent taller buildings give this rooftop bar some shape, and a glass roof and strings of lights give you somewhere to duck in a downpour. This stretch of Penn Avenue has long been one of the most attractive in all of Pittsburgh, and here you can look down on it from above. Hofbrauhaus, South Side. For a place with so many rivers, it’s a mystery why so few Pittsburgh restaurants seem to use them for anything. (To be fair, they were industrial sewers for 100+ years.) 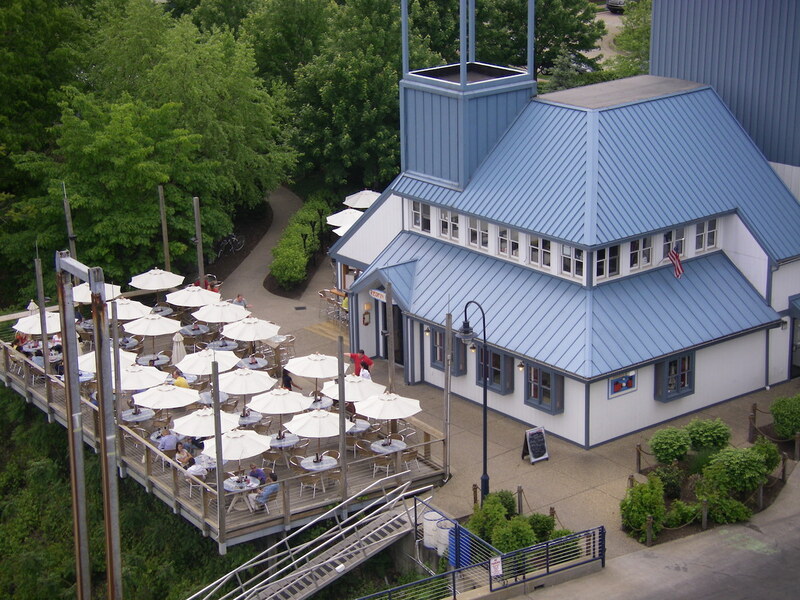 Hofbrauhaus is a major exception, now overlooking the city’s newest marina. Putting an authentic Bavarian beer hall on the water was a smart move, as it turns out. The back deck above the muddy Mon is so nice that the actual food and drink are sort of a bonus, rather than the main event. Outside Poros. Photo by Renee Rosensteel. Harris Grill, Shadyside. 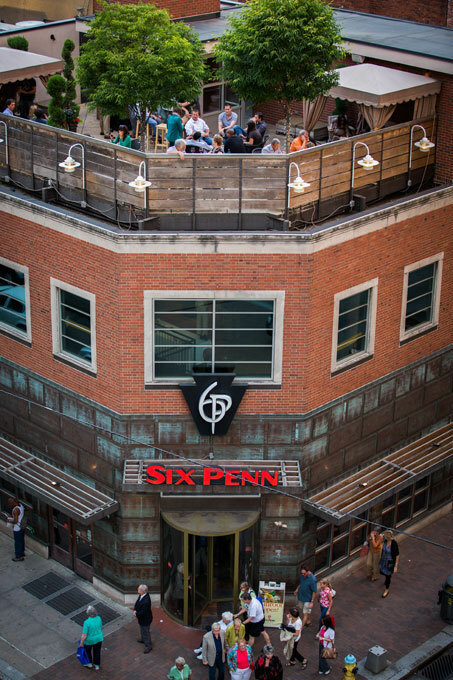 This is one of the original spots for outdoor drinking and dining, reminiscent of the days when Shadyside was a quasi-bohemian enclave of students, musicians and weirdos (really!). From Harris Grill‘s front patio, it seemed like you could see the whole city parade by—instead of just, you know, rich people. But it’s still the best place to devour baskets of bacon while drunkenly discussing Dostoyevsky, Derrida or the laws of thermodynamics. Shiloh Grill, Mt. Washington. The Harris Grill’s younger sister is a few blocks away from the tourists on Grandview Street. Shiloh Street has become a pretty lively place on its own, and the Shiloh Grill lets you eat Polish church basement Pierogies, wings and/or “Harris’ Hummus” while watching the parade of nightlife pass by. Pusadee’s Garden. Photo by Jennifer Baron. Round Corner Cantina, Lawrenceville. 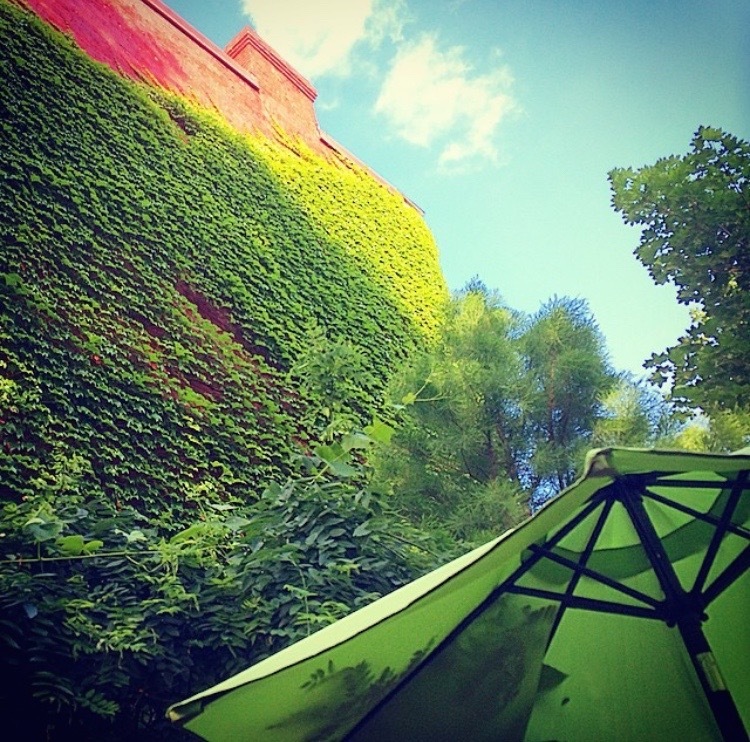 The Cantina’s “Cabana” is a strong contender for Pittsburgh’s best back patio. Also, perhaps the city’s premiere place to argue about tacos (who has the best, “most authentic,” etc. )—a contest rapidly overtaking pizza, Pens line changes and the ethics of parking chairs as our favorite thing to argue about. The space is pretty bare bones, with wooden tables lit by strings of tiny lights. But the kitchen serves up Mexican food until midnight on weekends, and there’s often top-shelf DJs spinning records—even though people are mostly there to eat and talk (not dance). A pitcher of sangria on a warm evening sounds pretty good, doesn’t it? The Porch, Oakland. Aside from the Point and the overlooks on Mt. Washington, this might be Pittsburgh’s most iconic setting—in the shadow of the Cathedral of Learning, on a soft green expanse between the largesse of the libraries (Carnegie and Hillman). The Porch’s profusion of patios includes an impressive stone fireplace for chilly nights and an unobstructed view of college town Pittsburgh, where you can nap on the lawn between classes at “Cathy” like the future is still ahead of you. Istanbul Sofra, Regent Square. The earthy, rich aroma of grilled meat and Turkish spices fills the air inside Istanbul Sofra, which is surprisingly free of the fumes from South Braddock Avenue. (Pittsburghers inexplicably think that street is the Autobahn.) It’s partially shielded by a wall of plants and fruit trees, big umbrellas and strings of tiny flags. Save room for baklava. Rivertowne North Shore, North Shore. This part of town still seems unfinished more than a decade after its redevelopment started. But one thing that was done right was the riverfront edge, which is oriented entirely toward the water. All the restaurants here overlook that postcard view of The Point. 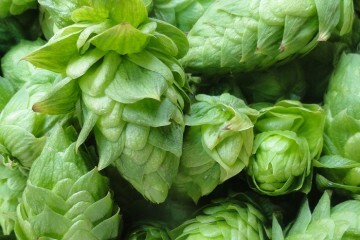 To pick just one, Rivertowne makes some good beers, and is an all-local operation, surrounded by chains. Redfin Blues photo courtesy of Maggie Jayson. Redfin Blues, Washington’s Landing. Somehow Redfin Blues, which overlooks a marina on the Allegheny, had Pittsburgh’s rivers all to itself for the longest time. (Remember when it was Troll’s?) Located on the island of Washington’s Landing, Redfin is a great spot to dine on the water from the deck overlooking the marina. The menu sticks to the basics, plus lobster rolls and “all-you-can-eat Alaskan Snow Crab Clusters” — and the beer selection is quite good. Spirit, Lawrenceville. Nightclub, concert venue, superior pizza place—is there anything Spirit can’t do? They’ve got a very nice, and very spacious back patio, too, for when your ears are ringing and you just need to clear your head. Meat & Potatoes, Downtown. Photo courtesy of Meat & Potatoes.Meat & Potatoes, Downtown. 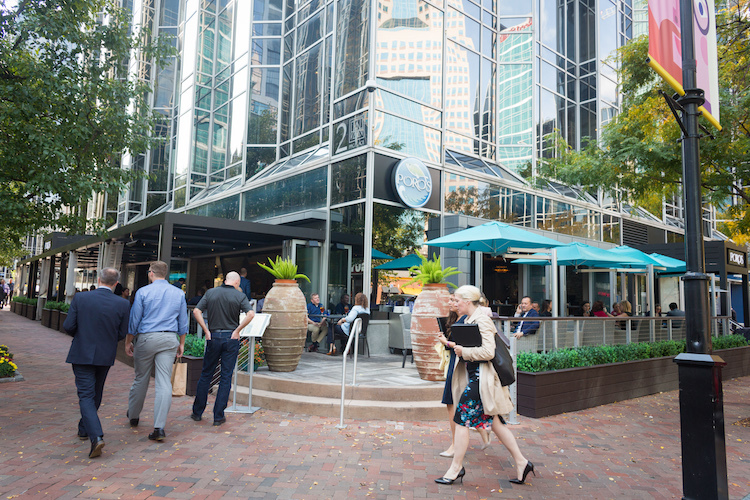 It’s hard to say when Downtown Pittsburgh really, finally became an actual destination for great food. It might have been before Meat & Potatoes, but the restaurant was the icing on the cake (or the fat on the bacon, or something . . . ). Everything about this place is built to last, from the simplicity of the menu to the huge amount of space devoted to outdoor dining. Right in the middle of the booming Cultural District, this is a great place to people-watch, with as many well-dressed theater/symphony patrons as mustard-stained Pens jerseys. The rooftop deck at Six Penn. Courtesy of Six Penn. Roland’s Seafood Grill & Iron Landing, Strip District. One of the best people-watching perches in Pittsburgh is right above Penn Avenue at Roland’s in the Strip. It seems like everybody in Pittsburgh—and boatloads of tourists—all want to get their cheap groceries and bootleg Stillers’ gear at the same time—and the bustle is a sight to see. Plus, you can eat big pots of mussels or “Hot Lobster Roll Sliders” while taking it easy on the large second-floor balcony.